The Tampa Chamber somberly released their Go Hillsborough poll results last week which showed only tepid support for any sales tax hike. They did not release the poll details but their poll of 400 likely voters revealed voters were about split in half but the poll had a margin of error of 5%. It is very likely that the results were well below 50% support for any sales tax hike. While the law enforcement investigation was going on we knew the Go Hillsborough shape shifters were busy behind Oz's green curtain - ready to pounce. Transparency has been lacking throughout the entire Go Hillsborough debacle so why start now? The desperation mode is cranking and the media propaganda is heating back up. A new poll indicates a majority of Hillsborough County voters would support a half-cent-per-dollar sales tax increase for transportation improvements if a vote were held today. The poll, conducted by the Tampa-based Mercury firm and financed by unidentified business interests, indicates the strongest support yet for the proposed tax. A total of 66 percent of those surveyed said they would either “definitely” or “probably” vote for the tax. The Tribune fails to report that the law enforcement investigation found no criminal wrongdoing but also failed to get all the evidence and that ethics complaints are still being investigated. The Tribune is playing their role as part of the "Insiders" who are pushing the sales tax hike. It is apparent that this is poll was timed, staged and orchestrated to coincide with the discussion and vote by the BOCC to put the sales tax hike referendum on the ballot. We assume the businessmen in the shadows who paid for the poll are the special interests who have been trying to decide whether to invest $2 million and their time and resources into the Go Hillsborough debacle and another failed referendum. It would be refreshing if these shadowy businessmen would spend as much time and resource holding our electeds accountable and pursuing funding solutions the commissioners themselves have the power to implement - than all their time trying to ram an unnecessary sales tax through - after we already said NO in 2010. Hagan said that by design, the ballot question does not mention light rail — a mode of transportation that opponents focused on and that was highly unpopular among suburban voters. Apparently Jean Duncan, the city of Tampa's transportation director, also did not get the message either. According to this recent TBBJ article titled Price tags placed on Go Hillsborough rail and streetcar projects, Duncan was guesstimating the costs of the fairy dust rail projects. Duncan mentions light rail as a mode for the rail from TIA to downtown. Modernizing the trolley is really transforming it into a street level light rail. Just who are "they" trying to kid deceive? Surprised? The company Mercury who did this poll is a PR and public strategy firm not a polling firm. Sound eerily familiar? Mercury is a high-stakes public strategy firm. We have world-class experts across a dozen different disciplines, all collaborating to drive the external environment and execute winning campaigns. Mercury Florida, a joint venture partnership between Mercury, a national bipartisan public strategy firm, and Floridian Partners, a statewide consulting and lobbying firm, announced its launch in 2013. The company is led by Mercury founding partner Kieran Mahoney, with leadership of Managing Director, Ashley Walker, who previously served as the Florida Director of Obama for America. We launched Mercury Florida last year  in order to create a new best-in-class public affairs consultancy in the state of Florida. Mercury is a high-stakes, bipartisan public strategy firm. The firm provides a comprehensive suite of services that includes federal government relations, international affairs, digital influence, public opinion research, media strategy and a bipartisan grassroots mobilization network in all 50 states. Soon after Hillsborough County leaders indicated they might seek a sales tax increase for transportation projects, several prominent private consulting firms started jockeying for work on a potential campaign to promote the tax. The firms were attracted by potential contracts worth tens of thousands of dollars. Similar campaigns, such as last year’s Greenlight Pinellas, paid well over $1 million, all of it raised from the private sector. Much of that money will go to companies that specialize in campaign management and communications. It was this kind of behind-the-scenes contact between consultants and public officials that already has cast a shadow over the county’s Go Hillsborough transportation initiative. Kieran Mahoney, Mercury’s chief executive officer, met with Merrill more than a year ago, on Aug. 20, 2014, less than a week after the county Transportation Policy Leadership Group agreed it needed to hire a firm with experience in transportation referendums. Merrill described his talk with Mahoney as a general description of the Go Hillsborough process. Remember this was August 2014 as the county was telling the public they were going to conduct a public engagement effort to create a transportation plan. The public was told funding would not even be discussed until after a plan was created. HA! At the August 12 PLG meeting, it was conveniently orchestrated after Merrill suggested hiring an outside firm to help for Commissioner Hagan to recommend a transportation expert (not a PR firm) be hired to do "public engagement". 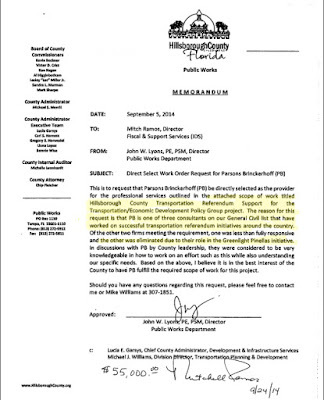 The public was not told that the county was intending to hire an engineering firm for a scope of work titled "Hillsborough County Transportation Referendum Support." The term referendum is political because it is about an election and voting. That was all orchestrated behind the scenes. The Eye's first public records request asking for documentation related to handing Parsons the no bid contract was September 9, 2014. Finally after numerous attempts to receive such documentation, we finally received requested documents on December 4, 2014 - following a meeting at County Center with County staffer Eric Johnson and Public Works Director John Lyons. The only assumption one can make for the county not providing timely compliance with our public records request is to keep this information from the public. By December, Leytham was fully on board and had already conducted her focus group electioneering activities in November to create a marketing message to launch the campaign. There was a pattern of behavior throughout the Go Hillsborough campaign with timely compliance of our public records request. referendums in consulting and successful transportation referendums. That was the primary criteria and then the second would have been, you know, just solid transportation engineering experience. But we wanted someone who actually had done this before in the referendum situation because that's different than just doing traditional engineering. Confirms again what we said from the get go - Go Hillsborough was a $1.35 million taxpayer funded PR and marketing campaign to push another sales tax hike. Unlike PSTA's Greenlight Pinellas marketing campaign, Hillsborough decided to hide their public engagement PR campaign behind the facade of an expensive engineering firm. Back to this recent poll. How do you have a valid poll on a proposed transportation sales tax hike that includes high cost rail that doesn't include asking about rail? Rail has always been part of Go Hillsborough as Mayor Buckhorn stated at the May 2014 PLG meeting that rail was part of the plan and everyone knows it. Buckhorn laid down his demands back then. Then he and the city of Tampa never had to pay one dime of the county taxpayer funded $1.35 million Go Hillsborough debacle. Buckhorn got to sit back and ride the coattails of the county's PR campaign to push the tax hike to pay for his trains. Go Hillsborough includes three high cost transit boondoggles: a rail from TIA to downtown, transforming the bankrupted trolley to a street level light rail and expanding it and a taj mahal BRT from Brandon to downtown that our transit agency HART never requested. No one knows the validity of any poll without the full poll details. Perhaps Commissioner Hagan should release the full poll details since he believes the results supports his position for the huge sales tax hike. What this poll proves is that the private campaign is in high gear and has already begun before any referendum has been placed on the ballot - just like 2010. No disclosures or reporting has to be done until a tax hike measure boondoggle gets on the ballot. It's not officially "electioneering" until there is an actual ballot measure. The Republican dominant county commission is "gearing" up for such a vote. By the end of this month they will decide whether to put the huge sales tax hike, proposed through a very flawed and deceptive process, on the 2016 Presidential election year ballot. We can only speculate what services have been pre-paid to evade disclosure of how much the campaign will actually cost to ram the tax through. Nothing has changed. It's the same broken template, the same tired playbook and the same people pushing another huge sales tax hike in Tampa Bay. What a novel idea: Have the company, Mercury, who wants the $2 million "big deal" advocacy campaign do a poll to help push support for getting the sales tax hike on the ballot. We await the Go Hillsborough shape shifters next tactic. But in Hillsborough County - it's 2010 all over again.